In last week’s article I looked at some of the fundamentals behind making the decision as to how to withdraw funds from a company for owners/managers. Following on, table one shows that if we look at the situation above the upper earnings limit/higher rate threshold, the advantage of dividends remains but is reduced, as was intended when the dividend tax changes were introduced to take effect from the current tax year. Remember, however, that to reach this stage at least £4,193 of employee National Insurance contributions will have been paid. 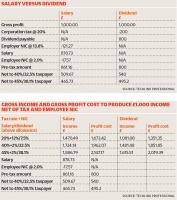 Table two shows the abolition of the 10 per cent tax credit gives dividends another advantage over salary/bonuses in that gross income is kept down. The smaller gross equivalent achieved by paying dividends is of increased importance when the (unindexed) thresholds for child benefit tax, phasing out of personal allowance, tapered annual allowance and so on are considered. Also significant is that the gross profit cost of the dividend route is less than the salary alternative for each tax rate. However, as a general rule, dividend payments are directly proportionate to shareholdings, which means the dividend or salary choice can become impossible to make when there is a mix of shareholdings and total remuneration targets. What is more, dividend payments rather than salary may have adverse effects where tests are generally salary-related: for example, mortgage borrowing capacity. However, the issue of lost second state pension no longer arises in the world of the single-tier state pension. When considering the alternative of a pension contribution this is, of course, only feasible if the individual does not need the money for expenditure. If this test is passed, the next question is whether a contribution with full tax relief is possible in the light of the tapered annual allowance, reduced lifetime allowance and any transitional protections in place. If none of these are a constraint, then the pension contribution is a completely tax-free exercise at the point of employer payment of the contribution. The simplest way to consider the end value is to ignore any investment return and assume an uncrystallised funds pension lump sum is drawn: i.e. 75 per cent of the contribution attracts (retirement) marginal rate tax and the other 25 per cent is tax free. Thus, for example, a higher rate taxpayer receives a net £700 (0.75 x £1,000 x 0.6 + 0.25 x £1,000) per £1,000 of contribution. The corresponding figures for basic and additional rates are £850 and £662.50 respectively. Comparing numbers at this stage starts to get complicated because of the dividend allowance and assumptions about how any dividend drawn would be invested (remember there is a £20,000 Isa limit from 2017/18). For a basic rate taxpayer, there is only limited advantage (via the 25 per cent tax-free element) until the dividend allowance is exhausted. Higher and additional rate taxpayers will see more benefit, particularly if their marginal rate falls in retirement. For those aged 55 and over, there is another avenue to consider in terms of drawing pension benefits rather than dividend/salary as a source of income, and making employer pension contributions to “compensate” the pension fund for the drawn benefits. This will be considered in a later article. Watch the latest webinar from our Financial Planning and Techtalk team. This masterclass will cover: An introduction to salary sacrifice The tax benefits for basic and higher-rate taxpayers Employer savings Legal and contractual aspects. Click here for link to webinar For the latest technical insights and support, visit our adviser hub.